Earlier there were actually no ways to get a DHBVN New Connection easily. The consumer had to roam with documents in hands and from office to office. There were long queues of people standing to pay DHBVN bill and to get DHBVN Connection. The company has solved these issues by allowing the consumer to apply for a New Electric Connection online. The process is simple and sophisticated and you will get to apply in just few minutes of working. This post is a detailed guide to Apply DHBVN New Connection Online right from your computer and not going to the office with lots of documents. Apply for New Connection: This section takes you to the Online Application form which you have to fill for the New DHBVN Connection. You can also track your application, if already submitted. For this guide we will only deal with the Apply Online Section. Circle: See the circle from your Neighbour's Electricity Bill or you can contact the customer care for asking the same. Subdivision: This is also available on the electricity bill at the top left corner. Category: Choose your specific category, for houses Domestic supply is needed generally. Application For: Choose New Connection from the list. Connected Load: Enter the load you require for your DHBVN New Connection Online. Supply Metering Equipment: Choose either you will buy the meter equipment or you require them from the company. Identity Proof: Identity proof of the person applying for a new connection. Check the required document form and know what all identity proofs are accepted. Step 7: You can leave the other details below blank and can fill them if you already have another account with the same account holder. Step 8: Click on the I Agree box and the click on Apply button. Step 9: It will show you an application number generated and a form which you can download for future reference. Step 10: The final step is to check all the details carefully and paying the fees for the application submission. 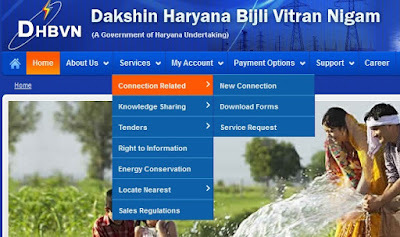 After the payment of fees your application will be submitted and you can Track your application from the 2nd section of the new DHBVN connection page as told earlier in this post. It will take few days before your submitted application for New Connection in DHBVN will be processed and worked upon. The tracking will show you that your application is in which stage. Thankyou for helping me out, i was not getting this tutorial about new connection anywhere else. Really great information provided with complete steps. I applied as same as shown.